The Cleveland Pro Chapter, Society of Professional Journalists Invites you to the Ohio SPJ Awards Luncheon at the Pro Football Hall of Fame in Canton, Ohio. The awards luncheon will begin at noon, Saturday, Aug. 26. Celebrate Ohio’s best journalism at the world renowned Pro Football Hall of Fame, in Canton, birthplace of the National Football League. 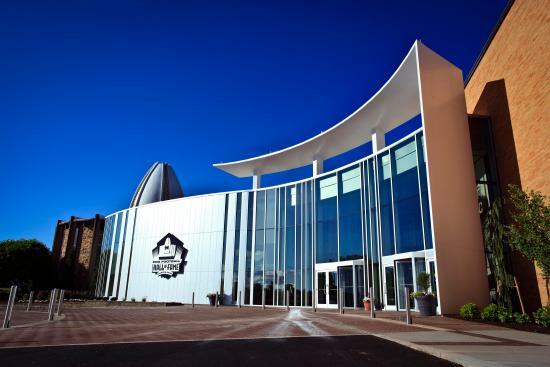 Guests will receive their awards and have complete access to HOF exhibits, videos and tours, and have the opportunity to see the amazing progress being made on the Johnson Controls Pro Football Hall of Fame Village, a $700 million "Football Heaven" being developed at the site in preparation for the NFL’s 100th season in 2019 and centennial celebration in 2020. Full day access to all that the HOF has to offer, including the exciting new holographic Super Bowl Theater. The museum remains open until 8 p.m. The Ohio SPJ Awards contest is staged jointly by the SPJ chapters in Central Ohio, Cleveland and Cincinnati. The awards luncheon is hosted on a rotating basis among the three chapters, with Cleveland hosting this year and Cincinnati set to host in 2018. The 2017 Ohio SPJ Awards luncheon celebrates the best journalism Ohio has to offer. The Pro Football Hall of Fame celebrates the best of America’s most popular sport. Put them together for a memorable afternoon Aug. 26! Click here to register today through EventBrite.